Is summer here? Or is it Autumn really early! I’ve heard that we should be getting the sunshine back again this week, which will make deciding what to wear a much easier task – I don’t know about you but I hate having to think of layers, I feel here in the UK we seem to have to do this all year round! 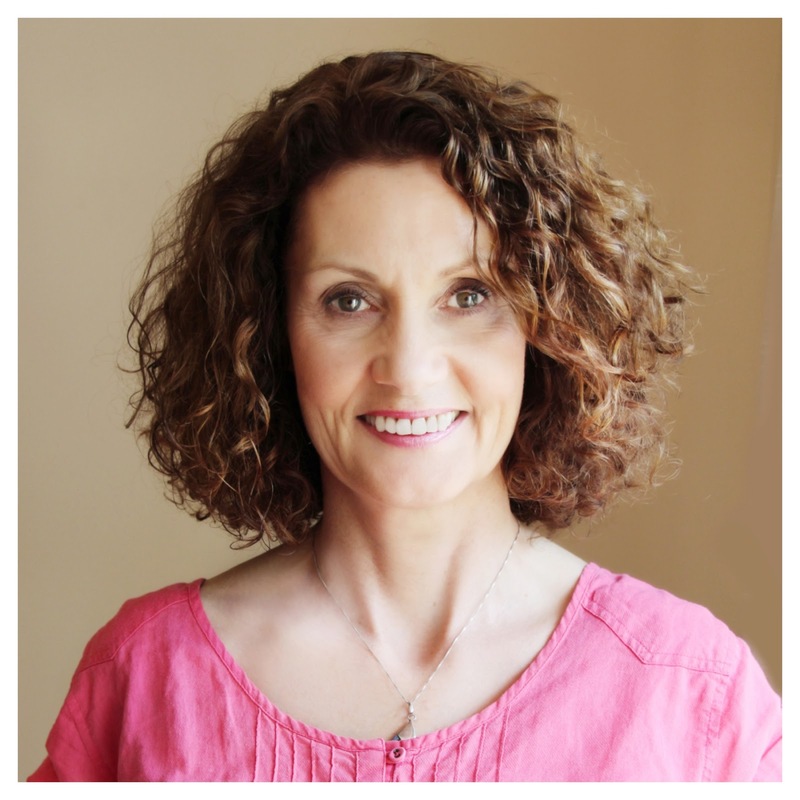 So talking of what to wear; a fellow blogger Catherine, has recently wrote a about how to dress professionally throughout the summer months at work. It’s always tempting to do more of the dress down look during the summer, but could this affect your future career opportunities? Catherine writes “If you have to think about whether it’s suitable for the office, it probably isn’t.” Read the full article here. This week across the news and social media we’ve all heard about the very sad death of Cecil the lion. In the past I would never have considered myself much of an animal lover, but two years ago I got my first dog, a bichonpoo called Alfonso – since then I now look at every animal as a different form of him, and it’s switched on a button in me that now can get very upset over matters like this. 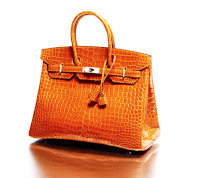 So I was really pleased to hear that the model Jane Birkin whose name has been used for years by Hermès for their iconic bag, which is known for having a six year waiting list, to remove her name. She’s found out that crocodiles are being farmed and cruelly killed to make said bags; it takes the skins of three crocodiles to make just one bag! 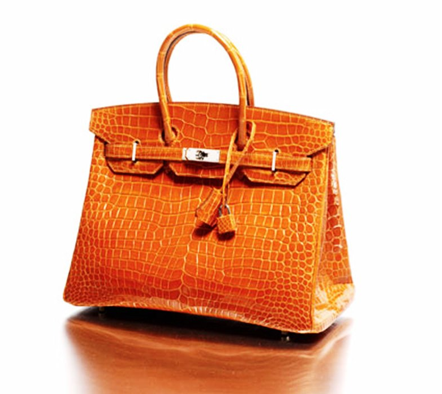 With Ms Birkin making this stance, and the hype of it across social media, this has now made owning a once truly desirable item, one of the uncoolest bags to have, overnight; the power of social media should not be underestimated! Read more about this here. A couple of years ago I was in Monte Carlo with my husband, we had just finished having afternoon tea at Café de Paris and we took a walk around, as we were passing Hotel de Paris, a lady stepped out and I kid you not she was well into a 90’s but she made my head turn, why? She was the most glamourous elderly lady I think I had ever seen. There was no beige, no practical shoes, she was brightly clothed and accessorised from head to toe! I said to my husband, “Look at her, do you see her? That’s what I want to look like when I’m her age” And I mean it. 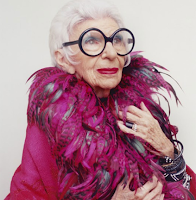 The person I have found that mirrors my aspiration is Iris Apfel. Iris was born 29th August in 1921, she’s currently 93 years old and has her own documentary movie out this week called, Iris. She’s an American business woman, interior designer and a fashion icon. Renowned for her stylish and eccentric dress sense, particularly her large glasses. She has been quoted by the BBC for saying “I think dressing up should be fun”, she was listed in 2013 as one of the fifty best-dressed over 50s by The Guardian. To get a feel for what Iris is like, you can watch the BBC’s five minute interview here. Showings of her movie are limited and mainly in the London area, but if you’re interested, you can read more about locations and dates here. And finally, I will shortly be heading off for some sunshine, destination not yet booked but I’m hoping it’s going to be hot, hot, hot. My recent purchase ticks boxes for dress down sight-seeing, dress up dinner, beach cover up, plus relaxed and easy travel wear. 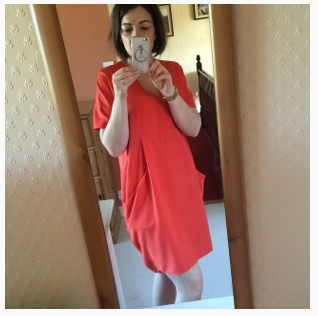 It’s bright, it’s red/orange and it’s definitely in my colour-season of autumn. 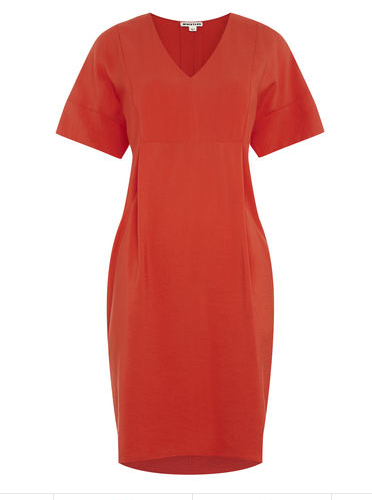 I love this dress, named Hannah from Whistles.